, D. D.an eminent scholar and antiquary, was born in 1738, and educated at Magdalencollege, Oxford, of which he was some time fellow. He | took his degree of M. A. Oct. 15, 1761, that of B. D. April 23, 1773, and in December of the same year that of D.D. Having entered into holy orders, he had the college living of Worldlyham, in Hampshire, and was afterwards rector of Tilehurst, in Berkshire. His first appearance in the republic of letters was as editor of the “Oxford Marbles,‘’ in which capacity he was employed by the university. The” Marmora Oxoniensia" were accordingly printed at the Clarendon press, in a magnificent folio, in 1763, with an elegant Latin preface by the editor, and a very copious index by his friend Mr. Loveday. 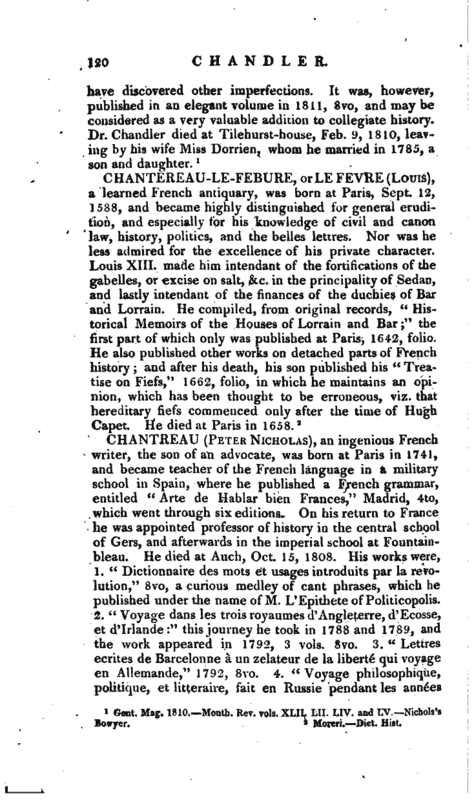 Mr. Chandler also corrected the mistakes of the former editors, and in some of the inscriptions, particularly that of the Parian Chronicle, supplied the lacuna by many ingenious conjectures. His next publication arose from his connection with the Dilletanti, a society so called, composed originally (in 1734) of some gentlemen who had travelled in Italy, and were desirous of encouraging at home a taste for those objects which had contributed so much to their entertainment abroad. On a report of the state of this society’s finances in 1764, it appeared that they were in possession of a considerable sum above what their current services required. Various schemes were proposed for applying part of this money to some purpose which might promote taste, and do honour to the society; and after some consideration it was resolved, that persons properly qualified should be sent, with sufficient appointments, to certain parts of the east, to collect information relative to the former state of those countries, and particularly to procure exact descriptions of the ruins of such monuments of antiquity as are yet to be seen in those parts. 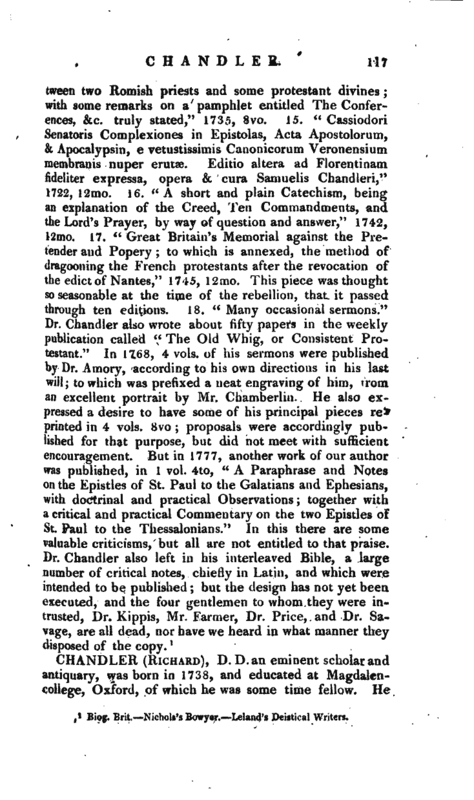 Three persons were accordingly selected for this undertaking; Mr. Chandler was appointed to execute the classical part of the plan; the province of architecture was assigned to Mr. Revett; and the choice of a proper person for taking views and copying bas-reliefs, fell upon Mr. Pars, a young painter of promising talents. These gentlemen embarked June 9, 1764, on board a ship bound for Constantinople; and were landed at the Dardanelles on the 25th of August. Having visited the Sigean promontory, the ruins of Troas, with the islands of Tenedos and Scio they arrived at Smyrna on the 11th of September, and from that city, as their head-quarters, they made several excursions. In August 1765, they arrived at Athens | where they staid till June 1766“; visiting Marathon, Eleasis, Salamis, Megara, and other places in the neighbourhood. Leaving Athens, they proceeded by the little island of Calauna, to Traszene, Epidaurus,Argos, and Corinth. Thence they visited Delphi, Patrae, Elis, and Zante and on the 31st of August they set sail for Bristol, and arrived in England November 2, following. The result of this tour was published in 1769, under the title of” Ionian Antiquities, published with permission of the society of Dilletanti. By R. Chandler, M. A. F. S. A. N. Revett, architect, and W. Pars, painter.‘ 7 Imp. fol. a volume which while it did honour to the society, amply justified the expectations formed of the talents employed. 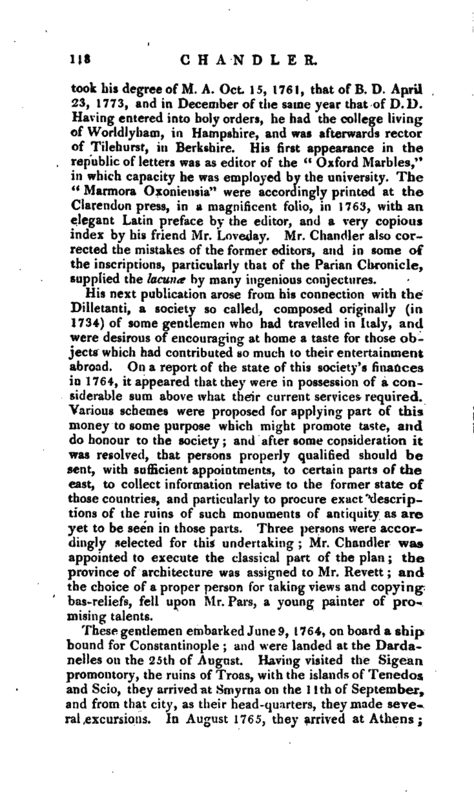 In 1774, Mr. (now Dr.) Chandler, published what maybe considered as a valuable supplement to the collections of ancient inscriptions by Gruter, Muratori, &c. under the title of “Inscriptiones antiques, pleraeque nondum editac, in Asia Minore et Graecia, praeseriim Athenis coilectse,” fol. Clarendon press. The year following he gratified a much larger proportion of the public by his “Travels in Asia Minor; or an Account of a Tour made at the expence of the Society of Dilletanti,” 4to, a work of considerable learning, and replete with curious information. 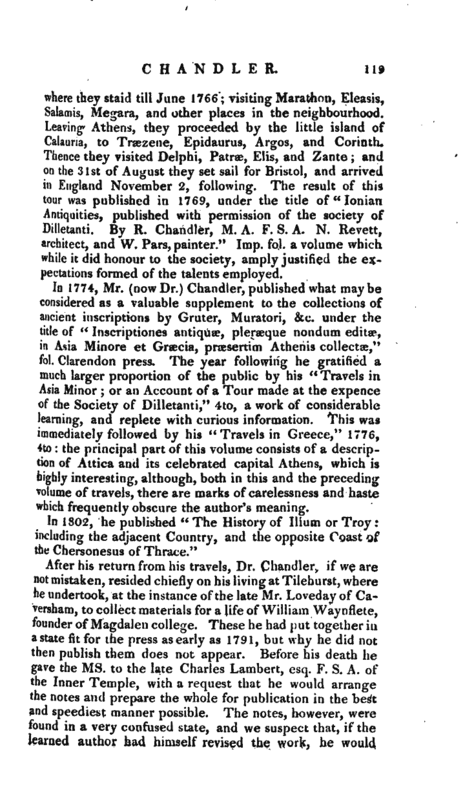 This was immediately followed by his ’< Travels in Greece," 1776, 4to: the principal part of this volume consists of a description of Attica and its celebrated capital Athens, which is highly interesting, although, both in this and the preceding volume of travels, there are marks of carelessness and haste which frequently obscure the author’s meaning. Gent. Mag. 1810 Month, Rev. vols, XLII. LII. LIV. and LV. Nichols’s Bowyer.